Have you been in such situation where all your valuable time and effort into writing a resume has brought you no expected results? 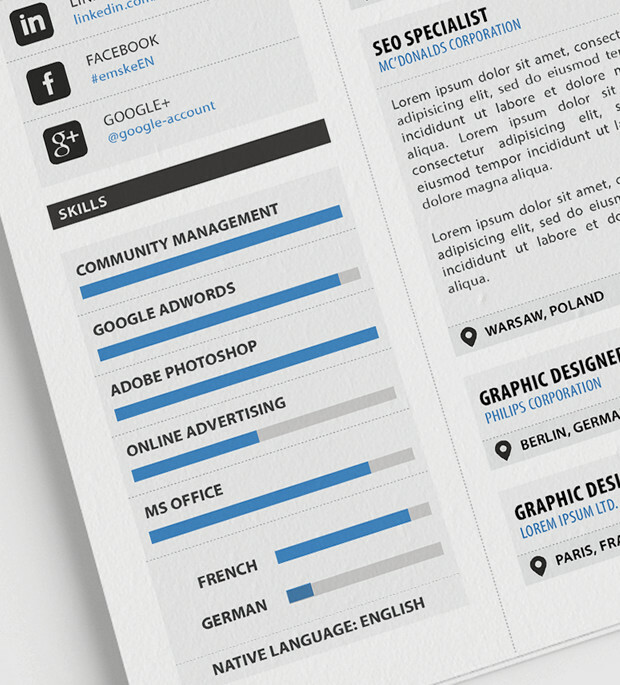 Today’s free file is a professional resume template prepared of the total attention about details. 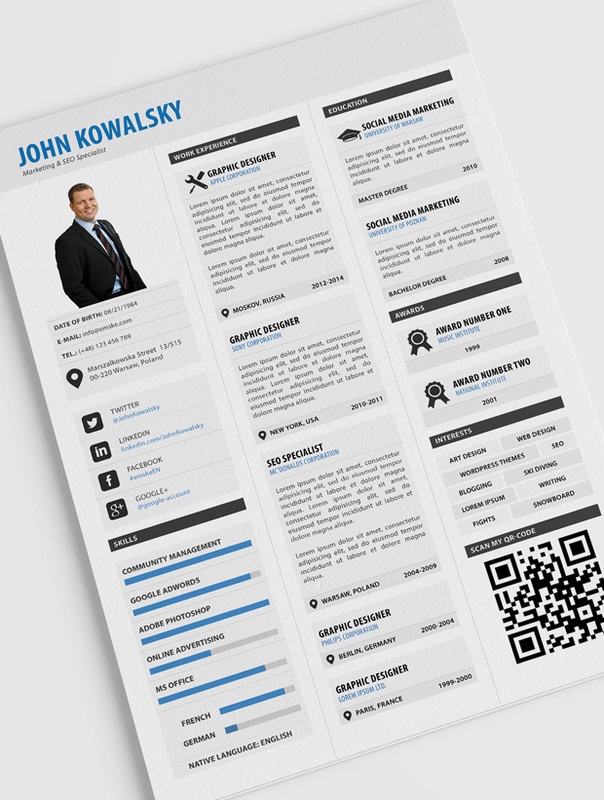 This sample of professional curriculum vitae template is ready to print, simply enter information about yourself, upload your photo and create a QR code. 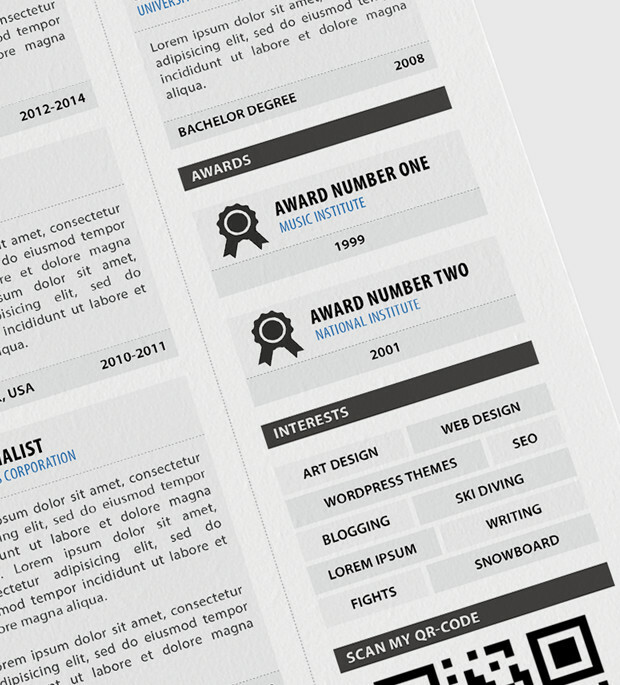 The document is divided into sections because it is much more readable than plain resume. On the template you can find such sections as contact information, work experience, skills, academic achievements and gained certificates/prizes. Package contains PSD, PDF (template files), license, readme text and a link to the used font. Don’t have the special graphics software, technical skills and time required to edit our template? Just send us the information that you want and we will send you a print ready version customized with your data for only $29.95. The only thing left to do is push the print button! Buy template customization now by clicking here. I love this template! unfortunately I can’t use it because the .psd seem broken, please could you fix it? I would thank you so much! Hello Nacho thanks for kind words, what version of Photoshop you use, this template was made in CS6 version, you can also use a PDF format template. Completley true! Working now! Again amazing design! Thank you!! Hey utku, The .zip file seems good I just checked and there are no problems in opening this archive :/ I use iZip archiver for Mac OS X, try to download once again maybe there was some problems when you download. I love the resume template and was wondering whether the PDF format template allow me to (1) enter my details; (2) create additional pages; (3) create new sections and moving sections around. Will any Adobe Reader 9 work or do I need some sort of upgraded or paid version ? If yes, can you please advise which one to use ? 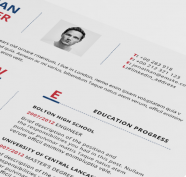 Appreciate your help as I would like to utilise a creative resume template for my resume. 21MB for a single PDF… aren’t 21MB too many for a PDF? Thanks for the feedback, yes agree, it’s quite big file size but it’s not simple resume and there are a lot of graphic elements etc. You can always reduce the size of the file by using Acrobat Reader Pro. This is exactly what I’m looking for! It’s beautiful, elegant, unique and sums up everything on one page. I have photoshop CS3 however it’s not allowing me to pull it up. Is there another link? Please help! Okay thank you, I’ll keep that option open however is it available for Photoshop CS3? There’s some color schemes I’d like to try. Unfortunately not :/ only this version what you have in pack. This this template is wonderful but am unable to download it it shows some error. kindly help me. Could you write something more about issues that you have? You can’t open a zip file or psd? Love this and made it to my CV. Do you have a cover letter to match? Emske.com is a collection of premium and free graphic, design and web resources that help make your designs and other projects look more unusual and original. All files are royalty-free and are created exclusively for Emske.com viewers. Want to become a premium member? Do it now. Becoming our business partner we give you the opportunity to make money by selling our graphics. If you are interested in partnering with Emske.com or would like to find out more about our partner programs for other websites please check our graphic affiliate program. Do you want a dedicated project? We do a custom digital services like logo design & branding, print templates, custom mockups, web templates, web coding, wordpress installation and more.